Audience Comments . . .
"I moved away four years ago in August and I sure do miss those wonderful concerts. I just want to commend you again for the wonderful job you have done over the years. You have brought much enjoyment to many people. I just wanted to thank you for the wonderful gift you are giving to others through your fine talents. God bless you in a special way" Eleanor Weber, Omaha, Nebraska. "Thank you for giving us an "All-American fourth of July with all the trimmings. It was like a Norman Rockwell painting!" Lewis and Betty Habegger, South Bend, Indiana. "Hebron Lodge #575 thanks you for the special consideration and congratulates all who have contributed to the twenty successful years of Community Band concerts. You, personally, deserve our thanks and that of the entire community for the inspiration, promotion, dedication, skill and success of this outstanding gift of pleasure and cultural development in Mercer County." "Throughout the concert season, I have received numerous compliments from local folks in the county and also visitors who attended them. "Thank you and your staff for orchestrating each marvelous performance - take a bow!" "We're looking forward to returning to Mercer. It's always been one of the best audiences we get to play for. An appreciative crowd makes what we do all the more rewarding" Alan Stiver, General Manager, Youngstown Community Band. "I want to thank you for all of the effort that you have put into making the Mercer Community Band the fine institution that it is today. It would be impossible to measure the amount of pleasure that you have provided for both the audiences and musicians by your sacrifices. I also want to thank you for giving the young musicians an opportunity to participate in the band, Our country needs more of this type of activity to encourage the next generation in positive projects. Believe me, our efforts are truly appreciated by many people. It has been an honor for me to get to know you and perform with you. "We appreciate what a continuing cultural and entertainment enrichment the Mercer Community Band offers to Mercer and to our many out of town visitors. We all enjoy the Mercer Community Band concerts and as a club are pleased to offer it our support"
"The concerts are true Americana in our minds and, I believe, many others who were there would agree. Obviously, you deserve the credit for these events"
Dr. Donald Birdsell, Professor of Education, University of Akron. "Congratulations on another fine performance this past Friday night in Mercer. Your special "Sounds of Summer" really entertains with quality music and light-hearted patter" Dr. Alan Steinberg, Westminster College. 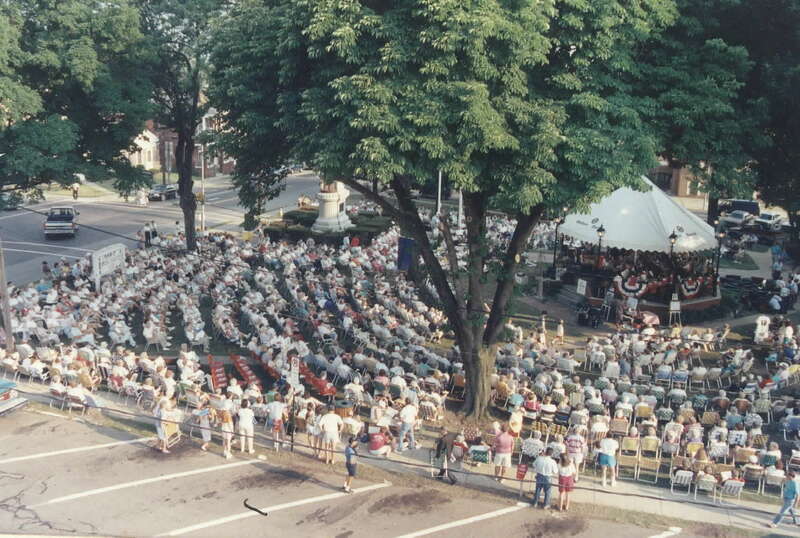 "During the summer, we all enjoy the concerts on the Courthouse Lawn. We particularly enjoy the various talents that you bring each week from throughout the county"
"I wanted to tell you and your staff what a wonderful time I had last evening. Everyone made me feel right at home. Thanks for everything that you did for me to make my performance in Mercer a memorable one." Joe Kirkwood, Erie, PA.